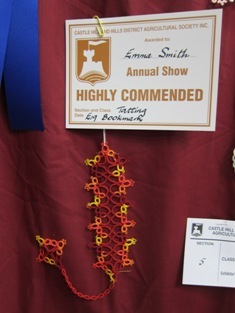 A couple of years ago, my 'Blue Ribbon' doily didn't live up to its name and came third at the Castle Hill Show. 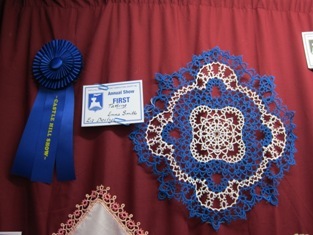 This year, the 'Blue and White Square' doily has made it to the top and came first. The doily is now sitting on a round table next to my rocking chair where I sit on when having a quiet time to myself. 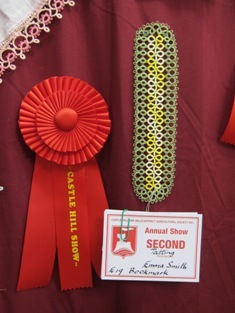 As for the bookmarks, one came second and one received a highly commended tag. I took photo of all prize-winning tatted pieces for the next newsletter of Tatters' Guild, NSW Branch, due out at the end of this month. So, here are the pictures of my winning pieces. The variegated red bookmark is on its way to Russia. Are you reading this, Boris? It's for you. Cheers. Thanks a lot, Em! I really like this bookmark! You are most welcome, Boris. Glad to hear that you like it. I hope you are making good use of the bookmark instead of putting it away and forgetting about it (and about me :-)).